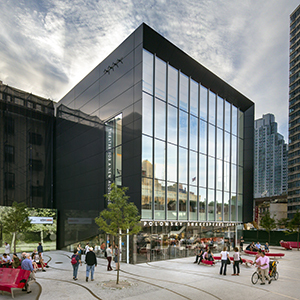 The Institute runs for two weeks from 10:00am until 5:00pm Monday through Friday at Polonsky Shakespeare Center unless otherwise noted. Morning and afternoon sessions focus on the academic and theatrical considerations embedded in the three plays under investigation. Scholars and teaching artists work together to plan daily activities that reinforce each other’s work, creating a seamless interface between scholarly and creative investigations. In addition, lunches and evening activities offer participants access to other scholars, literary experts, and theatre professionals. Evening assignments prepare participants for the following day’s discussions, and theatre outings provide a further basis for discussion of the concepts participants are learning in class. During the first seven days of the Institute, Professors Crawford and DiGangi will ground participants in the basics of sound scholarly research and theatrical practice, while teaching artists Krista Apple and Claudia Zelevansky will work with participants on the challenges of interpretation and performance that arise from deep scholarly analysis of text. In the last three days, participants will focus intensely on incorporating what they learn into their roles (as directors, actors, dramaturgs, designers, etc.) in final scene performances on the last day of the Institute. During the Institute, participants will attend one or two Shakespeare (or other relevant) productions as a group, preceded by a dinner and discussion of the play. Click here for the 2019 Institute schedule. Click here for 2019 Institute Reading List. 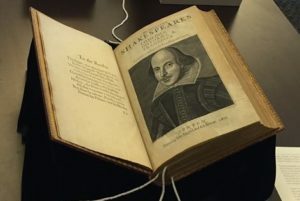 A copy of Shakespeare’s First Folio, which participants get to view and handle on the Columbia University Rare Book & Manuscript Library tour. Pictured above: Participants in the 2018 NEH Summer Institute for School Teachers; Polonsky Shakespeare Center, photo ©David Sundberg/Esto.